Poll: which dress for Austin Fashion Week's awards show? I am convinced that I have the most stylish readers, ever. Y'all have never led me astray when I've asked for your help, so I am asking for your opinion once again. Be my stylist! I need a dress. I need a lovely dress for the awards show for Austin Fashion Week. I am seven months pregnant now, but I want to feel beautiful and glamorous but at the same time be comfortable! I imagine that there will be photos (there will be a red carpet, after all), so I need to look good! 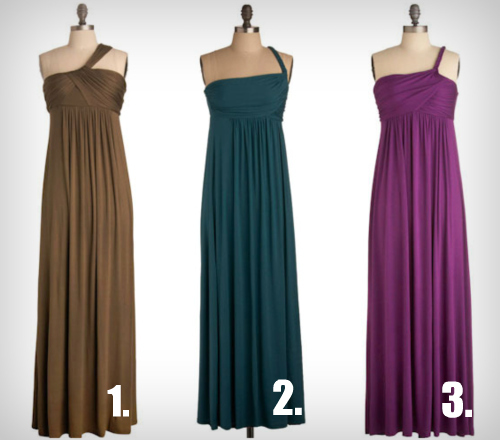 I've narrowed it down to three (very similar) maxi dresses from ModCloth. I can only afford one (they are each $59.99), and I honestly am stumped over which one I should get! I'll buy it on Wednesday and wear it to the awards show so long as it looks okay and gets here in time! Update: Thanks for voting! I can't believe how close it was. The olive Demeter dress has been ordered! It will debut in the near future!